There’s plenty of evidence to prove it, one of which is a Mesolithic settlement which goes all the way back to 7,000 BC. Not only that, but throughought the ages there’s been a Roman Town, and also Bronze and Iron era evidence of people settling here. Throughout its history, under many different names, Thatchham has been a place that people have lived in. There’s been various attractions along the way, plenty of reasons people would be attracted to this beautiful place, from man-made buildings such as the Chapel of St. Thomes the Martyr – which is now the Old Bluecoat School, for those who didn’t know that – and more natural places of interest, like the Thatchham Reed Beds. Taste the Cracklin can’t claim to have quite as much history as the town does… not as a company, that is. Hog roasting itself on the other hand shares with Thatchham a history that goes a long way back. Hog roasting was always a treat, savoured by kings, queens and peasants alike, today it still holds a special place in peoples hearts as an event favourite, found at most big occasions. It’s our aim to continue on with that trend and find as many events in Thatcham as possible to hog roast for – hopefully yours too! Picking from a mix of great Taste the Cracklin hog roast services, there’s no solution we can’t give for your event. We’ve got it all, from lone hog roast menus to whole buffets of food, to menus designed for seated consumption, with several dishes being served by the waiting team direct to your guests. The menus cross event types, there’s a package for every occasion imaginable, party’s to weddings, business breakfasts to beer festivals. The hog and spit roast creations are always a treat, never short of a magical spark to bedazzle your invitees. We hit guests with the finest in hog roast catering, brought together by the best chefs and waiters there is. The best part of it is that once we’re gone, if not for the memories of the delicious food you’ll have ate, you would never know that we were there, such is the immaculate condition our team will leave the site in. But we don’t leave it at that, our service starts long before your event. From now until then we’ll always be hear to help you in as many ways as possible. It’s quite normal for us to advise clients on their event planning, after all we’ve been involved with so many events, who better to ask than us, right? And so with that you can imagine that the office team are almost non stop on the phone, if they’re not taking queries they’re helping clients with event details. Even the chefs get in on the action! When chefs aren’t behind a hog roasting a pig they’re often found speaking directly with clients, helping to put together a fully bespoke menu for one event or another. They do this for everything from business breakfasts to wedding receptions. 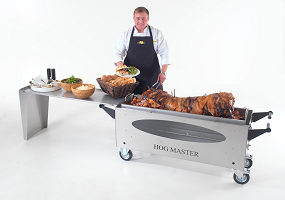 With how perfect our hog roasts are you might think it impossible that you could ever do it yourself, after all how many years experience and what top level hog roasting technology must we be using. Well we’ve got a surprise for you… You absolutely can make a it just as good because we’ll give you one of our machines and we’ll even sell you a pig while we’re at it, assuming you want one! The Taste the Cracklin plan is really easy, easier than that one Jackson 5 song. You choose a machine, choose a date, make the booking, and before you know it we’ll be arriving at your chosen location to drop the machine off for you – and a pig if you buy one while ordering. There are various machine models for hire, so if you need help choosing the machine you’ll need our team will advise you, either over the phone or via email if preferred. We hope that you like the sound of hog roasting as much as our current Taste the Cracklin clients do, if you do then have a look around and give us a call when you’re ready to book, or just for a chat.